In writing, research, lecturing and just plain old working, I see over and over again the need for us not just to educate ourselves about technology, and project management but to remind ourselves that this is “not your Grandfather’s Archive” (with apologies to Oldsmobile aficionados). In some ways the archives world that I was trained in was more of a warehouse atmosphere. Preservation and scholarship were the goals….and if you get a chance… do a little promotion. That is a far cry from the reality that television documentaries and technology tools have created today. The archive is the star of more than a few television shows now and the archivist or librarian is the key to the new economy…the world of information. As gate-keepers of the past, we took that job so seriously (maybe a little too seriously) that we often forgot to have fun with our collections and more importantly our users. I am happy to report that fun is back in the archives! These technology tools have empowered archivists to be creative with promotion, crowd-sourcing and documentaries. The ability to show someone their great-grandmother screaming at a WWI protest march from halfway around the world, or transcribing the price of strawberries in NYC in 1915 (as in NYPL -What’s on the Menu Project) or developing a coalition of the great-grandchildren of a WWII regiment is not connecting people less to history, in fact it is connecting them more to history and to their global cousins with shared interests. An archivist is supposed to be a good citizen of their community. It is what I and generations of archival professors have taught their students. You must be involved in your community. Today with a global presence potential in every archive, our global audience yearns for connection to our forefathers, our heritage, our hobbies and each other. This is a really exciting time in the profession but it means some loss of control. Cutter numbers and authority files are going to take a hit in order to engage our communities to our collections. It does not mean that we will not continue to quality check our records but it means more time might be spent on those communication connections with our users. Certainly more time will be spent evaluating community tags than we will spend re-vamping the controlled vocabulary. Some of you might think it is better, some worse, but even in my deepest control freak heart of hearts, I am really enjoying the sense of community that these tools are creating. Archives are a true part of this global community. Welcome neighbors! Digital Archiving: Fun for everyone? How did one institution attract 50,000-plus volunteers to help with an archiving project? The National Library of Finland is in the process of digitizing its archives so that they are fully searchable on the Internet. Scanning the centuries-old newspapers, journals, and documents isn’t so much the problem as is accurately transcribing the text. OCR (Optical Character Reading) software can only do so much. Standard fonts are easy enough for a computer to identify, but aging print in fancy scripts are more difficult. Obscure language, proper names, and decaying paper also interfere with OCR’s text recognition. In order for the materials to be accurately digitized, every document must then be double-checked by human eyes. To help with the process, The National Library of Finland teamed up with Finnish technology company Microtask to come up with an innovative solution: make a game of it. Granted, it’s hard to imagine how anything like checking manuscript text against a computer’s digital interpretation could really be fun. But Microtask saw things differently—instead of pages of repetitive work, they broke down each individual word-check into what they (appropriately) call microtasks. You might be asking yourself “Why should I do this?” Good question and also the point of this post: At the heart of library/archive advocacy is the active pursuit to continue to influence the community at large to the worth and purpose of the local library or archives. Last week, I talked about the difference between advocacy and public relations as well as presented a good base on how to create and use social media as advocacy outlets. Since the steps to create a social media outreach/PR campaign are similar to creating an advocacy campaign, I’ll discuss more on how to use social media effectively to create, maintain and engage with your community. Because there is so much to cover with this topic, it is divided into two parts, the first of which covers creating a brand, connecting your social networks, engaging your users, and lastly, creating meaningful content. While I give examples to illustrate my points in this week’s post, next week I’ll spend more time on the WHY you should be doing this rather than just creating the approach to doing it. When I began to outline this series, my goal was to make sure that each weekly topic flowed into the next so that the current week built upon the previous weeks discussions. As I spent time moving topics around so that each week would (hopefully) flow seamlessly to the next, I kept getting a nagging feeling that something was just not right. Two of my topics, advocacy and public relations/outreach, were the culprits and I finally realized why. The nagging comes in because at first blush, I tend to personally use the words advocacy and public relations pretty interchangeably and I wondered if I did that, it wouldn’t be too far of a stretch to believe that others might do so as well. So what is the difference between the two and why are each of them important? Social networking is about connecting people with similar interests on a much larger scale. A year later, I still firmly believe that it really is that simple. As I said last week, the problem, however, is that in the last year there seems to be plethora of presentations, sites, workshops and classes (to name a few) that will push the need for social media in libraries and archives but rarely will define what social media is. One hand, this is great as it gets the word out for the need of using social media as part of a librarians or archivists daily job routine. On the other hand, the pushing of the tool without defining the tool is still causing huge resistance in using that particular tool. Why? A conversation I seem to have a lot these days is discussing the use and instruction of social media, specifically for archival and library institutions. One particular topic that I keep coming back to over and over again in these conversations is that there is a huge push for institutions to use social media, with this push intensified by conferences and professional organizations (to name a few outlets). These outlets heavily advertise posters, panels and classes (to name a few methods) that teach professionals the hows of social media and networking with specific illustration of the more popular social media tools without really explaining the whys. This in and of itself is not a bad thing. Last winter, Alexis Braun Marks, Kim Schroeder and I presented at AMIA‘s yearly conference on this very subject. Our topic, “When Are New Technologies For You?” was an attempt to give a general overview of what social media is and why it should be used while illustrating a few of the big players in the social networking world. Our audience poll at the beginning of our presentation only enforced what we knew from our research: Most institutions are desperate to get on the social media bandwagon and know that they should, but they have no idea WHY they should or how to go about doing it. Then what happens is that many institutions end up doing one of two things: they join every social network under the sun and then forget about it or they just ignore the siren call of social media in the first place, artificially secure that they don’t need it in the first place. 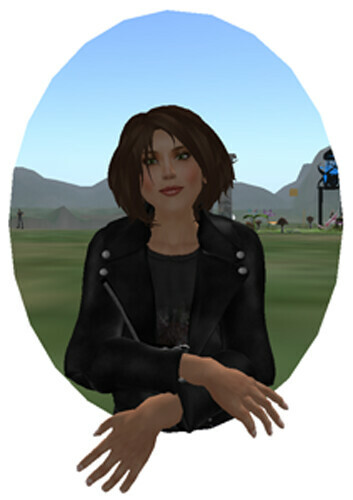 If you’ve heard of Second Life but wasn’t really sure what it was, or perhaps you’re feeling hesitant about learning “another” new thing, take heart. I’m here to provide information and guidance to this new social media tool. Check out this 3 minute YouTube video for a quick demo on Second Life and how it’s being used to teach university classes. In a nutshell, Second Life is a software program that looks like you’ve entered a three dimensional (3D) world on your computer. It’s fantastic for demonstrating processes, displaying artifacts and information, interacting with other people, collaborating, building in accountability to distance education courses, teaching complex concepts, simulations and more. As if it couldn’t get any better, creating an account in Second Life and using their software is free! I’ve discussed Twitter in a variety of capacities on AMPed but mainly within the context of using mashable technologies that include Twitter, but I have not discussed a feature of Twitter that sometimes is overlooked – retweeting. Awww RT@stephenfry Plus *eyelidflutter* Steve Jobs said “Hi, Stephen” *swoon*. In this case I’m commenting on a tweet originally sent by @stephenfry, whom I follow and in turn, I forwarded that tweet to my followers along with my comment. Because of the format of the tweet, it is generally understood that everything before the “RT” is by me and everything after the “RT” is by the originating author. And this is accepted as the norm in Twitter communication for since time immortal (or 2006). It is exactly like email forwarding, with the exception that you cannot selective choose who your retweet goes out to, it has to go out to all of those that follow you or none at all. In March, Rachael Clark discussed the necessity of completing a needs assessment as one of the important skills used in developing a digital collection. I would definitely agree that it is a vital skill for any information professional. Cliché as it is, one of my go-to phrases is, “If you fail to plan, you plan to fail,” and performing a needs assessment is an essential part of the planning phase for any project. This includes diving into the world of social networking. The first decision to consider with your team is what kind of social media outlet will be most beneficial. There’s more to the world of social networking than microblogging on Twitter. You can get your professional persona out there with LinkedIn, share attention-grabbing images of your collection using Flickr or post a webinar on YouTube. Consider your needs, speak with people who are fully immersed into the world of social networks and learn from them. There are many options from which to choose. Do a bit of research into what will work best for your organization before you spend too many “hit and miss” hours. Time is money, folks!